I've been on a bit of a mission this year, to get my house decorated as best as I can, and to make each room feel as though it's somewhat complete or near to how I want it to be. I soon realised I wouldn't be able to afford to go all out on each room, but I have found that by tweaking things slightly and adding new accessories here and there, can really make a huge difference to a space. My living room has been the biggest challenge, but one that I really wanted to do something about as I spend so much time there. It's a huge room, one which we took up the carpet in and then kind of left... It's not felt very homely for a long time, but by adding a cosy rug, some throws and a few decorative accessories, it's really starting to come together. 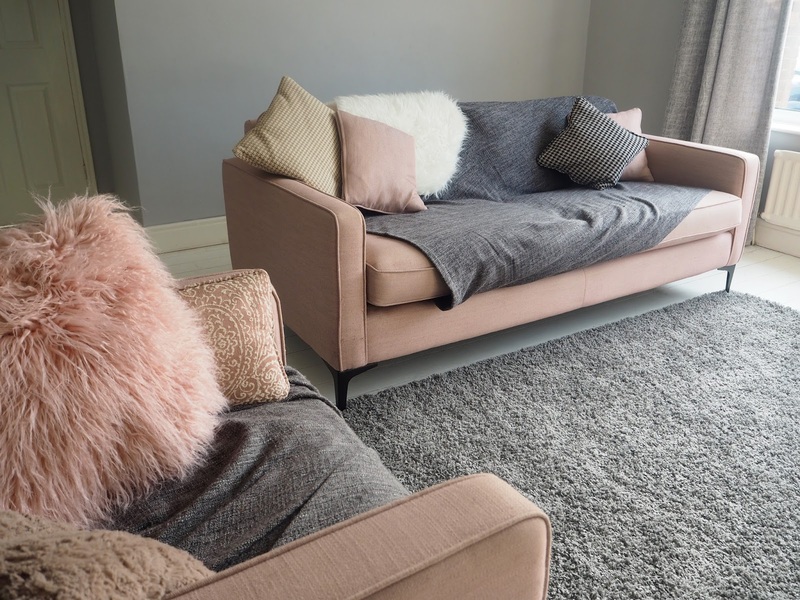 The theme of the room is pink, grey and white which I absolutely love and I know that by adding those few more accessories, some being practical, some just for decoration, everything will just come together as I imagined. I have quite a lot of space behind my sofa, as I pulled it forward from the wall when I got the new rug. Wanting to utilise the space, I think I want to get a long console table and a ladder shelving unit to pop some plants and ornaments on. The room is definitely missing a lamp, and the geometric floor lamp is exactly what I have been searching for... the colours are perfect. I also really want the faux fur foot stool, so that I can put my feet up as I type, and to add a bit more texture to the room. As for decoration, I love metal lettering... I definitely want to get myself a T and an E for Elodie to put on the mantle piece. I already have a pink fluffy cushion on m chair, but I think the addition of a grey fluffy cushion is needed... Don't ask me to explain why, I just love it too much not to get it! I also really do need something like the collage photo frame, as I have hundreds of photos, and nowhere to put them... I always think photographs are a simple step to making a room more homely too. Lastly I have been eyeing up the marble side table, which I think I need two of, one for each side of my sofa. This may seem excessive, but I'm toying with the idea of not getting a coffee table, and getting these instead... What do you think? The next room I will be starting work on is my bathroom, as I have a new bath ready and waiting to be installed... bring on the bath bombs! Luckily, my bathroom is really tiny, so work shouldn't take too long or cost too much (I hope). One thing I definitely want in there is an illuminated mirror, much like the one above from Pebble Grey. I think they're such a good idea, especially for in small rooms where the lighting isn't great. I also really want the grey marble accessories, which would look so chic against my white bathroom suite, best of all they're a complete bargain too! To utilise the little space that I do have in my bathroom, I know I need to be really careful with the storage options that I choose, and so far, after looking through endless home sites, I have been most drawn to the Next brass storage unit, which I think is very 'me'. I think it will fit the theme I'm going for as well as being versatile enough to work with another theme if I change my mind, or redecorate in the future. Lastly, I don't have any plants in my house, and I think this cute aloe plant would look brilliant against the grey and gold to brighten the room up. Please let me know if you have any go-to home shops where I might find more pieces to spend my money on! Loved this post! I love the combination of blush pink and grey, so pretty!